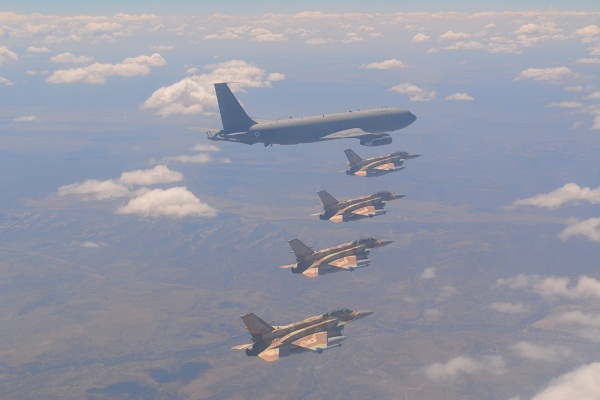 The IAF's "Sufa" (F-16I) Squadrons and the "Desert Giants" that operates the "Re'em (Boeing 707) have returned to Israel upon the commencement of the international "Red-Flag" training exercise, which was held in "Nellis" AFB in Nevada. 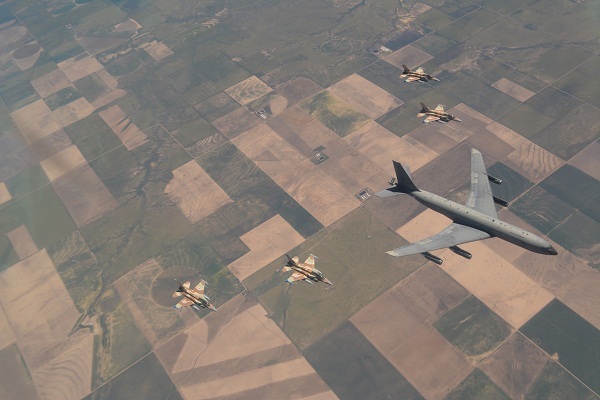 During the exercise, which is considered one of the most challenging and realistic in the world of combat aviation, the squadrons rehearsed coalition flying with multiple air forces such as the USAF and Spanish Air Force. "The exercise excellently simulated warfare, because we were required to fly in unfamiliar territory and in challenging topography. In Israel, we are used to flying over familiar areas so it is difficult to surprise us but here, it is really flying into the unknown", shared Maj. Gil, Head of the Overseas Exercises Department. "The American infrastructure was exceptional and included many ground and aerial threats that created a warlike atmosphere". 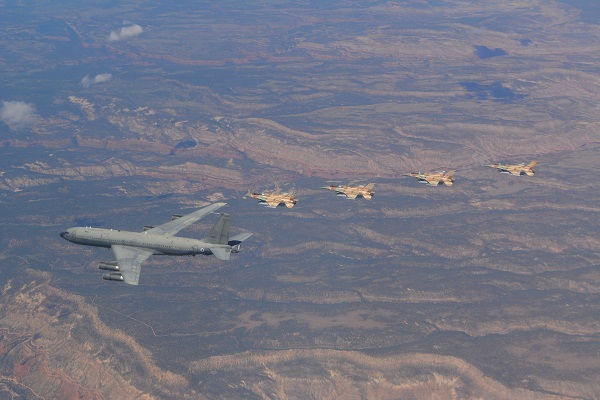 Over the course of two weeks, the Israeli aircrews rehearsed attack and air-air scenarios with their partners from all over the world in USAF "Nellis" AFB. During the attack sorties, the crews used advanced munitions, some GPS and laser guided and general purpose bombs. The participants rehearsed various scenarios such as PSAR (Pilot Search and Rescue) protection of a pre-determined area and strategic strikes, all in English and while facing multiple threats and the world's most advanced aircraft. They attacked, defended, surprised and were surprised. "We participated in 18 sorties, eight jets in each sortie and were on base for about 16 hours a day", elaborated Maj. Gil. The "Red-Flag" is considered the IAF's central over-seas deployment, in which IAF crews meet pilots and WSOs from various countries, share experiences and learn from each other. "We were on base with partner countries, so we had a chance to observe their techniques and methods, what we do similarly and differently. We had the opportunity to learn from their experience and understand where we can improve". 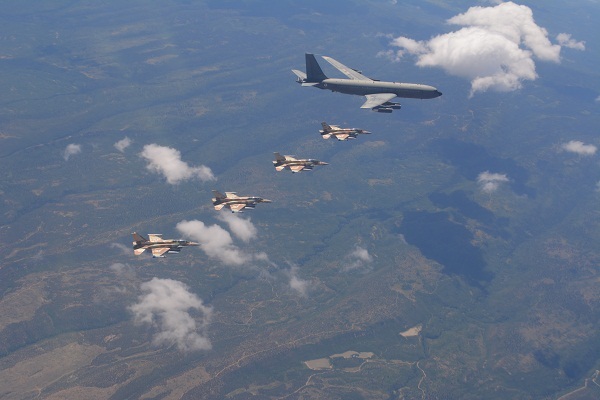 The 6,800 mile journey from Israel to Nevada was performed by IAF aircraft over the course of a few days including stops. The journey to the far away continent was performed with the help of the "Desert Giants" Squadron, whose tankers were responsible for Aerial refueling of the fighter jets and that also participated in unique scenarios in the exercise itself. "The transfer flight took three days and included a number of stops, it is a very challenging operation", stated Maj. Gil. "We took a large number of fighter jets and put them on the other side of the world. There aren't many countries that can perform this kind of operation, it is a unique capability". Drawing Conclusions: "Our combat doctrine has proved itself"
As fitting of the IAF, upon returning from last year's "Red-Flag" exercise, all of the IAF participants held a comprehensive debriefing and it is now the time to implement the lessons learned. "There are tactical conclusions such as how to plan the sorties and itinerary", shared Maj. Gil. "At the flight level, the main conclusion was that our combat doctrine works and proved itself in the exercise. The goal is not to re-invent the wheel, but to fly exactly like we plan to in war". As a result of the exercise's paramount significance, the delegation members held a preliminary preparation. "In the preparation, we focused on four components: language, standard, culture and knowledge. The participants underwent many instruction sessions, sharpened their knowledge of flight regulations and learned how to conduct on the radio in English". "The first week focused on practicing the basics of flying in English", explained Maj. Iftach from the "One" Squadron which led the workshop. "The briefing, debriefing, flight and communication with the tower were all performed in English in order to prepare the crews for the deployment". For the sake of optimal simulation, two American Air Traffic Controllers traveled to the IAF's Southern ATC Unit in order to control the teams and train them in communication with a foreign air traffic controller. In addition, as part of the preparation, the participants practiced performing aerial refueling in accordance with NATO combat doctrine. Alongside the aircrew members, over 100 maintenance personnel also took off for the exercise, and were responsible for maintaining the aircraft and making sure that all of the equipment they need in order to perform their duties arrive to the deployment base, while taking the length of the exercise and possible malfunctions into consideration. 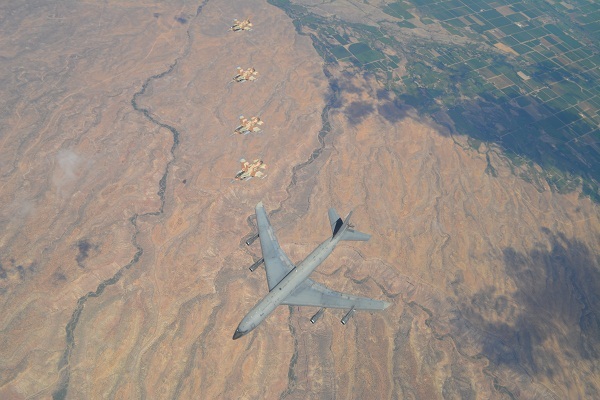 "We began preparing for the deployment last October", said Lt. Col. Avi Bachar, Deputy Commander of Ramon AFB's Maintenance Squadron and Maintenance Commander of the deployment. "We had to choose the personnel to travel with, not a simple task in itself and which aircraft from the base to take with us".